You’re the owner or manager of a small business. You’re facing mounting competitive pressures and shrinking margins. Differentiation has become harder and harder because your competitors are one click away on the Internet. You need to create consistent, high-quality experiences to keep prospects and customers coming back for more. You’re in luck! CRM was built for exactly this need, and many CRM vendors make it really easy to sign up. So just give them your credit card and let the good times roll, right? CRM success is never guaranteed. The harsh reality is that most CRM projects are doomed to failure. It means money and time spent implementing software (or a “web application,” if you prefer) that falls into disuse six to eighteen months after implementation. It means using email and spreadsheets and accounting software to track sales sub-optimally. It means eliminating any chance at a decent understanding of how your business is doing. It means leaving you exposed to missed opportunities. It means stranding you and your team back where you started. In many ways, the biggest cost of a failed CRM rollout is the lost time—the six to eighteen months that you will never get back. Time your competition used to build and advance. Time you could have used to accelerate your business…if only you had properly adopted CRM. I’ve helped hundreds of small businesses successfully adopt CRM over the last (yikes!) twenty years, and I’ve learned a few tricks to CRM success the hard way. One of the most fundamental of these is a simple philosophy that we preach: managers buy, but salespeople use. Yes, it’s a bit simplistic. 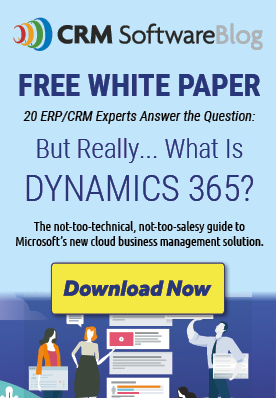 Of course managers will be using CRM as well as salespeople. 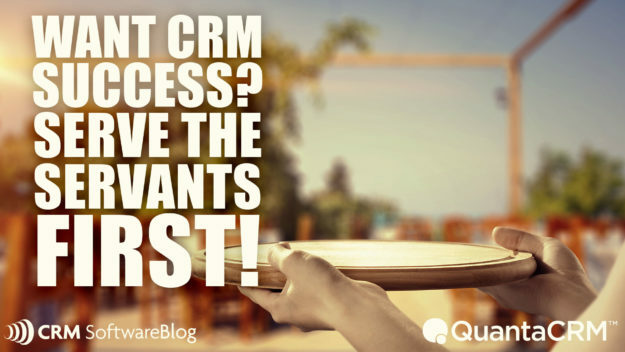 In fact, they had better be using CRM if you want your implementation to be successful! But the truth is, if your focus is on reaching management goals—typically things like better visibility and tracking, greater efficiency and effectiveness, higher customer retention, and the like—you will spin your wheels and get nowhere very quickly. As much as we all like to think everyone is in it for the good of the company, it just isn’t so. Telling people to use the CRM to meet management goals is a recipe for failure. But all is not lost! Management goals are a byproduct of good management. Good management involves a ton of different elements, but in the context of successful CRM implementations, it means you need to make life easier for your people on the front lines. These days, salespeople and customer service representatives are being asked to do more and more with their days. They juggle more prospects and accounts, learn new sales skills for the Internet-era, provide better follow-ups and touchpoints, and much, much more. Your focus with CRM should be to make life easier for your team. Nope! It’s a friend that makes their lives better. It’s there to help serve prospects and customers. It’s there to help manage follow ups. It’s there to remind your team of the hundreds of things they need to do to be successful salespeople and customer service reps.
Bottom line: a well-implemented CRM puts more commission in your salespeople’s pockets. Done right, CRM acts like an invisible personal assistant that helps your team deliver that consistent, high-quality experience that keeps prospects and customers coming back for more. And if you can do that, you will meet your management goals as a natural result of good CRM usage. Azamba Consulting Group is a Microsoft Gold partner out of Chicago, IL with more than two decades of experience helping small- and medium-sized businesses reach their goals through the use of CRM. Our OnTrack CRM Success System enables CRM projects from implementation to adoption and beyond, and our top-notch Microsoft Dynamics 365 CRM support team ensures you get the most from your CRM long after your implementation is complete! Great info regarding CRM software that are used in the Customer relationship management category and this blogs can shows us how CRM success serves the first. Great information about CRM. This kind of information is useful and easily understood. Concentrate each stage on a particular CRM target that is intended to deliver a “fast win” – that is, significant outcomes in a sensible measure of time. Littler, more reasonable stages can yield more energy and higher end-client appropriation. You’re constructing an all-encompassing methodology, utilizing a well-ordered process. Comprehend where your organization is heading. Ensure the product merchant you’ve chosen can give the extra usefulness you may require in a few years. Select one that will empower your CRM programming to develop as your organization develops. Ensure it can be tweaked for your business and customized for the coveted client’s understanding. Most likely about it – CRM adoption can be a long, regularly exorbitant and tedious process, however in the event that actualized right it can change everything: beginning from your day by day schedules, ways you treat your clients or change over your leads, to your incomes and even your business profile. Great points Charles and I’m in agreement. I intend to tackle a few more of the points you raise in future articles. For this one, it was top of mind because I had a conversation with a prospect that same day where they had a “big brother” approach to CRM and felt his number one need and reason for CRM was to watch over his people. With those prospects, my warning flags also spring up. CRM rarely works if it’s all for the management and no consideration is given to the front line people. Unless the management is willing to run with an iron fist and begin firing employees who don’t comply. I rarely see that level of commitment to enforcement. And frankly that’s not needed if management shifts their perspective a bit to focus on what the sales and service people get from the investment! Great post, Peter. Change management is a critical piece of any software implementation. I’ve seen it happen way too many times over the years. Management picks a system and voila! So involving key team members from the outset is uber-important to make sure that the change is indeed serving the servant! One challenge that I’ve continued to face for nearly two decades is business owners and managers feeling CRM is a slam dunk. It probably sounds sad and pathetic but I spend a good portion of my waking hours thinking about this. LOL. Part of that is my passion to moving the needle of small businesses as best as I can with huge impact. I really believe in CRM as a tool to help businesses be more effective, efficient, and profitable. Unfortunately there are a lot of ways it can go wrong so it takes strong guidance and an eye on change management (as you stated).